Luang Phor Thuad Roon 4 Kaipa Lek Archan Tim Wat ChangHai BE2504. Nur Alpaka. 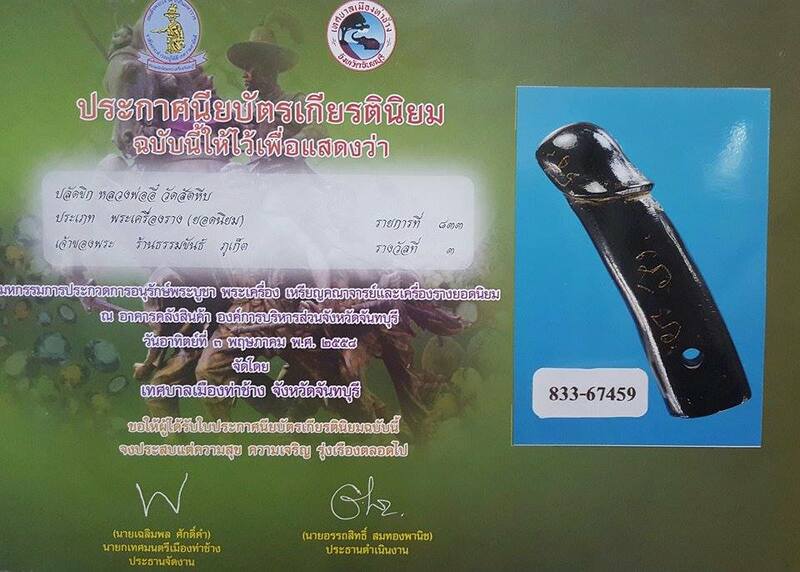 It comes with Thaprachan Authentic Certificate. Attached with Gold Waterproof casing. Luang Phor Thuad Archan Chum Chaikhiri Wat Phra Baromathat BE2497. Chanted by 108 monks for consecutive 28 days from 14th September until 12th October BE2497. Week 4 – Protection from Evil Spirits, Black magic and Illness. Pure Gold Takrut Luang Phor Thong Wat Khao Yai Hom BE2559. Disciple of Great Luang Phor Koon Wat Ban Rai. First Batch Nur Mai Jantan Rodbot NapranBoon Phor Than Seng Wat Ban Trang BE2558. The material is a 200 years old wood from temple. Bottom insert with Manora powder and soak in Manora oil. Made 1,000 pieces only, serial number 250. Cow Luang Phor Sin Wat Lahanyai BE2557. Black Buffalo Horn material. Tao Wessuwan Luang Phor Jarun Wat Ampawan BE2555. Nur nawa made 999 pieces only. Serial Number 659. It comes with original temple box. Takrut Phitsamon Luang Phor Gaew Wat Phuang Malai BE2460. One of the Top 9 kreunglang recognized to wear in Thailand. Luang Phor Gaew Wat Phuang Malai born in BE2393. He was the first abbot of Wat Phuang Malai. Luang Phor Gaew wrote yant “Hua Jai Seua Sa Ming” on the Bailan leave and folded it into the Takrut Phitsamon. This takrut is famous for Maha Amnaj (Authority), KongKrapan and Metta. Luang Phor Gaew passed away at the age of 69 in BE2462. X-ray picture to prove this amulet was not broken and repair. It comes with Standard Amulet Authentic Certificate. Verified in Thailand Nakhon Pathom Grand Amulet Competition on 12th February 2017. Palakit Luang Phor Yee Wat Sattahip BE247x. Sea Coral Wood material. Rare in market. 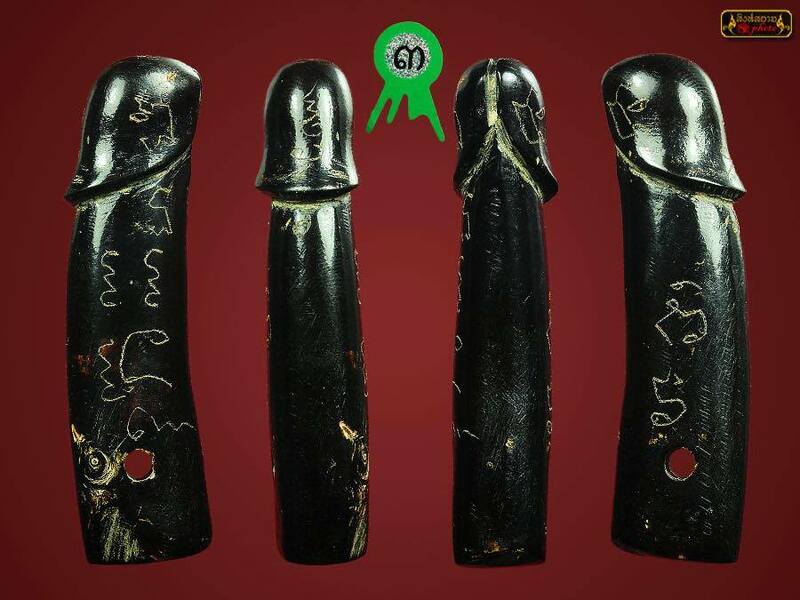 It won No3 Placing in Thailand Chantaburi Grand Amulet Competition on 3rd May 2015. Attached with Gold Waterproof casing.